Approximately 40 per cent of value of international trade comes from goods carried by air, and the consequences of goods being damaged, destroyed or delayed can be serious, substantial, and perhaps unforeseen. 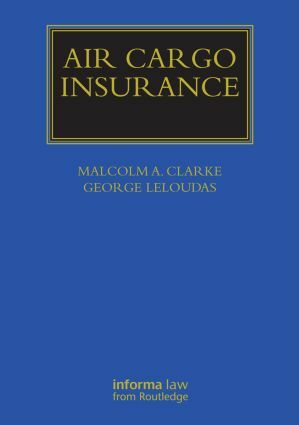 This exciting new book is the only one on the market that deals exclusively with air cargo insurance, and will therefore, be a vital addition to the collection of any practitioner, professional or academic working in the field. Air Cargo Insurance analyses the model policies and standard terms and conditions on the London markets. The authors also provide readers with an invaluable perspective on cases in other jurisdictions, and the book discusses freight forwarders’ relations with airlines and addresses the possibility of recovery from third parties. This book, written by two of the leading experts in the field, provides invaluable guidance to practitioners, arbitrators and cargo-claims professionals. It will help to ensure that air cargo insurance contracts are better drafted and enforceable, as well as assisting in cases of disputed claims. Academics and postgraduate students specialising in the areas of in air and insurance law will also find this book extremely useful. Malcolm Clarke is a Fellow of St John’s College, Cambridge and a Professor of Commercial Contract Law at the University of Cambridge. Dr George Leloudas is an Associate Professor at the Institute of International Shipping Law and International Trade (ISTL) of Swansea University.